Lately, I have been thinking a lot about ‘superheroism’. Partly, because of my Afro Supa Hero exhibition currently on display at the V&A Museum of Childhood, that is centered around my personal collection of African diaspora pop cultural action figures and comics; but also because I see it as a theme that is gradually becoming more visible in society. A trend, I believe is primarily due to the phenomenal rise of gaming across all different platforms and devices. Virtual worlds offering momentary escapes from our real lives through new identities, avatars and alter egos. Sophisticated pursuits that are no longer purely the preserve of children, but also taken through to adulthood. Although, I am not a big ‘gamer’ myself, I find this whole subject fascinating, especially when I relate it to the African-Caribbean experience in the UK and how many people of my generation; the 1960s first generation Britons, born of Caribbean parents; spent years searching for their own identity. Even though a sense of displacement was something we shared with our ‘brothers and sisters’ in the Caribbean and the US, I believe our experience in Britain was quite unique. The patriotism, they showed for their respective countries, was a feeling that was often completely alien to me and many of my peers. Here, we were a group of citizens who felt no more at home in the country of our birth, than we did in the homeland of our parents. In Barbados I was called a ‘Little Englander’ yet in Britain I was seen as a ‘bloody foreigner’. It was an identity crisis that took me years to come to terms with, and even to this day, I still tend to identify more with being a Londoner first and foremost, than being British. It is experiences like these that have pushed me throughout the course of my life, starting in my early teens, to explore and embrace African Diaspora history and its legions of super heroes and heroines. It fuels my belief that uncovering the truth in ‘History’ is the great equalizer that can help address many of the negative perceptions that surround race, religion, sexuality and gender. It also informed the approach that I took in creating my Afro Supa Star Twins™ that adorn my exhibition branding and merchandise. From the outset, I wanted my characters to be accessible to everyone. I was deliberate in making them twins, one male and one female because of my belief in harmony and the equality of the sexes. In terms of the Afro style, on one hand, and purely for selfish reasons, it embraces the main phase of my childhood; but on the other it was also a dynamic time of ‘Black self-pride’ and ‘Afro-consciousness’ as the formality of the 1960s civil rights and counter-culture movements, paved the way for the free form funkiness of the 1970s. Although certain strides have been made in the depiction of black cultural heroes and heroines, one issue that still continues to linger is the assumption that a white super hero is for everyone, yet a black super hero is only for black people. Actually, the ultimate global super hero right now should be from the Han Chinese community, if we are to take our cue from the latest global population statistics. 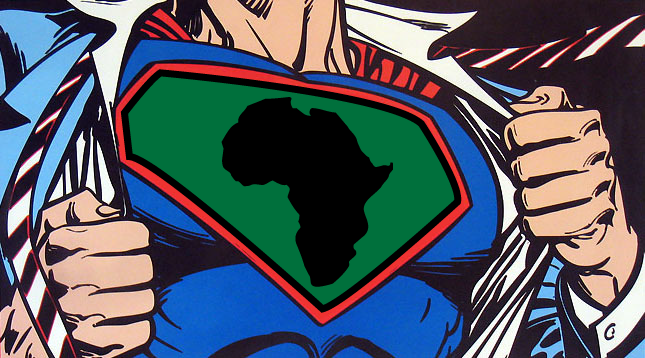 If we are to go by history, and embrace the scientific facts that suggest all life on the planet came out of Africa, then a super hero of African origin is an entirely fitting concept to be embraced by all. I have no doubt, the continued portrayal of the white super hero savior of humanity is down to the historical legacy of racism and the continued white male dominated power structure within the worlds of media, television and film. Maybe once they are finally able to accept the ancient African roots of their identity, the world will be a better place for us all.